It’s been awhile since I’ve shared a day of eats, and while they can get old pretty fast, I think it’s fun to see what other healthy living bloggers eat with their busy schedules. Everyone’s idea of healthy differs, and it’s interesting to see what those ideas are. You know that one spice that you can barely pronounce or describe but you just know when it’s in something you’re eating? I know a lot of people who can’t stand the taste of cilantro and if a dish even has a hint of the herb, they’re done. That’s how I am with tumeric. For awhile now I’ve been on the fence about it — I didn’t love it, I didn’t hate it, but it’s ususally the only thing I can taste when it’s in a dish. The smoothie was actually killer — “The Golden” has organic coconut milk, raw honey, orange, ginger, flaxseed, and tumeric. The tumeric is the most prominent flavor in there and it changed my mind on the spice. The flavors were great and it wasn’t too sweet, which normally would turn me off because I love my smoothies to taste like dessert. But it was just sweet enough to keep me interested and I automatically felt healthier drinking it so win-win. I did all my grocery shopping and some food prep for the week (it was my day off since I work weekends). 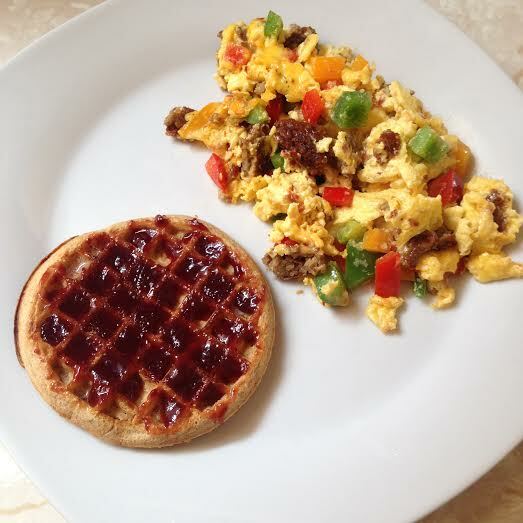 I had scrambled eggs and a Kashi waffle + jam on the side while I did my work (plus some pistachios on the side). 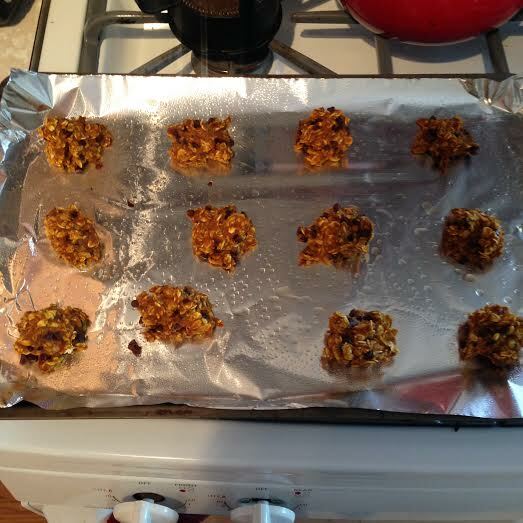 Food prep included pumpkin bites that came from mixing pumpkin, oats, an egg, tons of random spices and chocolate chips in a bowl and throwing them in the oven. They actually turned out great! I love how pumpkin keeps desserts from drying out. I also kept up my lucky streak of “throw everything together and hope for the best” and made some Crockpot Chicken Tortilla Soup. I’m sure there are 100 recipes out there but I should definitely share this one because it was so good! It’s also 90 degrees out so I’m not sure why I was craving soup, but I went with it. That night I met up with my guardian angel Brigitte for a nine miler along the lake. 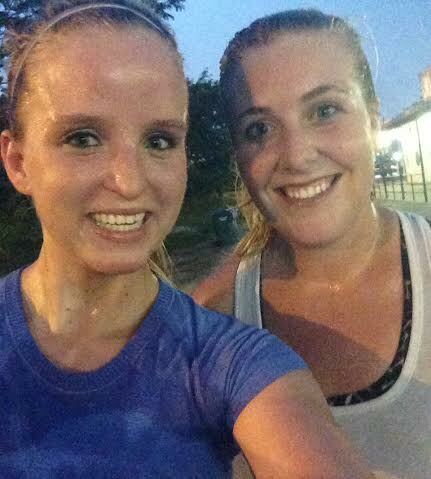 It felt like I was running in a sauna but we made it happen. Thank goodness for this girl otherwise I definitely would have stopped after half a mile — it was hot, sticky, and there were gnats everywhere. I must have eaten at least a dozen and they kept sticking to my sweaty skin as I ran. Nasty. 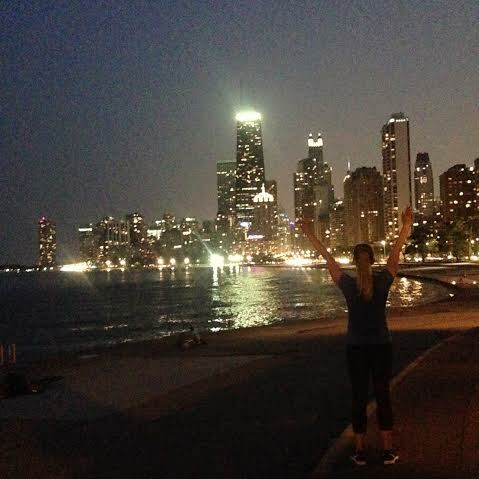 I’m normally not a fan of nighttime runs but it sure is cool when they start off sunny and humid and end with this view, the skyline lit up in the moonlight. Absolutely beautiful. 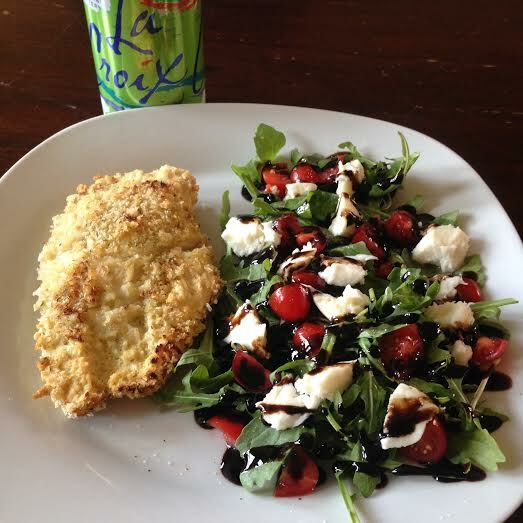 My favorite meal lately: baked chicken (garlic, dijon, and panko) + arugula salad with cherry tomatoes, buffalo mozzarella, and EVOO + balsamic glaze. I could eat this meal for the rest of my life (and I probably will because it’s so easy and pretty darn cheap for how fancy it looks). Dessert was a few too many peanut M&Ms, but I gave up feeling bad about that years ago. M&Ms bring me happiness, so I’ll never compromise on that. It was my favorite kind of day — any day when I can grocery shop, prep food for the week, watch The Kardashians, and run makes me all kinds of happy. What’s the one “unhealthy” food that you won’t compromise on? Is there a spice or herb you can’t stand? Arugula is my jam! Glad someone else can appreciate its awesomeness 🙂 they make the best salads. Chocolate milk after a run is great too! Plus you get all that amazing protein. I live for pizza. I don’t care what anyone says but I have it at least once a week! And I cannot deal with rosemary… please do not put it anywhere near me or the food I am eating. Amen to pizza! I don’t think I’ve ever turned down pizza, and I never will. We make caprese a ton but I never really thought about just throwing that on top of some arugula and making it a salad! I might just do that to get in some more greens! I’ve had turmeric in recipes but don’t really recall caring about it either way. What temp and for how long did you cook those pumpkin bites? Those look so good! 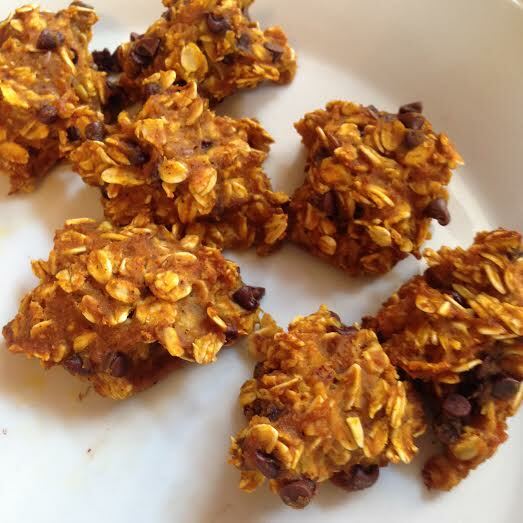 I was randomly craving those no bake oatmeal cookies that are full of chocolate the other day, but I think pumpkin would be a healthier option! I can’t get on board with expensive smoothies. I make my own healthy smoothies at home for cheaper, so whenever I see $7 smoothies, I just can’t do it! I baked them at 350 for 15 minutes. It was an experiment that fortunately turned out well! That doesn’t happen often haha. Making your own smoothie is ALWAYS a better idea. I would thing ginger would be the most prominent thing. I love to throw that in my smoothies. I was just thinking about you yesterday as I looked at my jars of turmeric that it will take me a year or more to finish. I still need to give you some! Hahaha yeah we’ve talked about that a lot! I imagine your pantry as a Costco-sized spice rack whenever you describe how much you have haha. I’ve been added spices to my smoothies and they definitely change the flavor but I dont mind it. I dont think I would be willing to give up wine. Or ice cream. Totally with ya on ice cream. I don’t have it daily but when I do have it, there is NO portion control happening. I enjoy every bit of it! I am one of those people who wants to throw daggers at cilantro, so I understand. I do like turmeric, though! I think it has to deal with my infatuation with mustard. I LOVE mustard. On a deep level. I throw that stuff on top of my salads at restaurants as my “dressing”. No kidding. Cilantro is a very polarizing herb! So many people absolutely hate it! 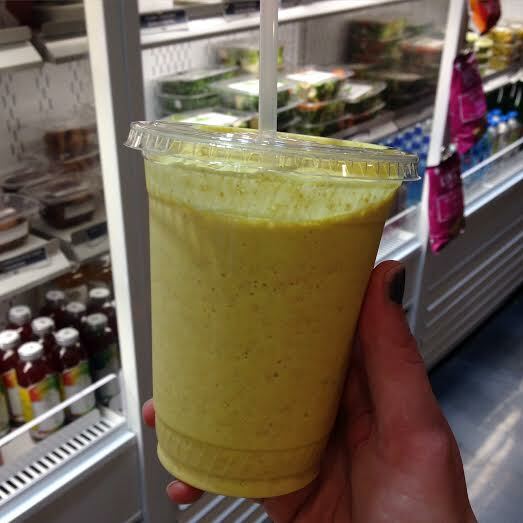 Mustard is great — I make dressings OUT of it, but I don’t know if I could just pour it on top haha. Love your outlook on peanut M&Ms! lol. That’s how I feel about nightly spoonful (or a few…) of peanut butter! No compromises there! I take turmeric every day! It’s really made a difference with my inflammation and recovery time after lifting heavy. Good to know! Do you have a tablet form or do you just eat a spoonful or put it in your food? Very interesting! I take it in pills. I try to add it to food when it makes sense, but this is just easier to do consistently. oh no the Kardashians are back on….Argh! I need to confess something. I finished off ATL. from start to finish. Don’t be tardy to posting that tortilla soup recipe. So do you just bread the chicken in panko using the Dijon? Genius!!! May I have a cookie, please?! Luckily I fell asleep pretty easily but if I had a 5am wake up call it would have been a different story! I cannot stand anything hot. So sriracha, hot sauce, anything that says “with a kick” or “zesty” is out. #baby I also cannot stand mayo and I’ve tried the vegan kind. It’s a deal breaker. Uhhh is salmon skin unhealthy? Cause I will NOT compromise that! ha! Haha I can’t imagine you have very many unhealthy vices 😉 I wish I could go sugar-free…my body would thank me but I’m addicted! What a pretty run view! 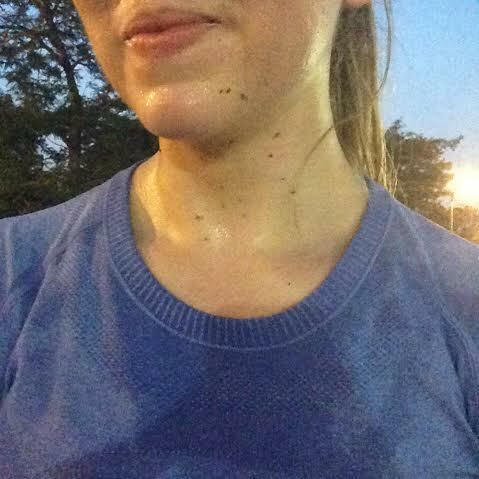 I give you props for running in crazy humidity – I don’t think I’d make it haha. I can’t wait to start using pumpkin in everything again this fall! It was miserable haha I’m not looking forward to another run tomorrow morning 😉 pumpkin everything is the key to happiness! That smoothie sounds sooo good! I am a big fan of the throw everything together and hope for the best method. I just made a soup in my slow cooker like that! I also love to use a packet of soup as a base when I don’t have much time and add a whole lot of veggies and a can of tomatoes 🙂 I cannot stand cilantro!! As you say, even a hint is so offputting to me! Hahaha what is it about cilantro? So many people say that! I love the crockpot — so much room for creativity and risk! Your dinner looks sooooo good. Also, I’d definitely try that smoothie! One unhealthy food I don’t compromise on is pizza. No cauliflower crust for me! Amen! Pizza is definitely something you don’t mess with!! I absolutely love that pic of you with the skyline. Such a perfect view of a great city! I looooove turmeric because I am obsessed with Indian food! And I totally made that chicken yesterday with the mustard and bread crumbs. 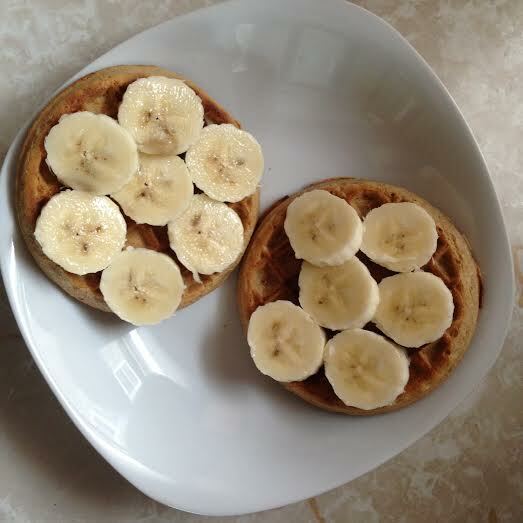 It was simple and yum. Thanks! No way! Nice! Yeah it’s so easy and I don’t feel bad wasting eggs for egg wash. I wish I could get on board with KitchFix, but man, they are SO expensive. So, so, so expensive. I mean, I suppose all the ready-made healthy meal places in Chicago are the same–My Fit Foods and Snap Kitchen are insane as well–but I just cannot throw down that kind of $$$ on the regular. And/or ever, unless it’s on an enormous, indulgent meal. And kale salads are not something I file under “indulgent.” Hahaha. Also I want that smoothie… Like now! Froyo is amazing! the best part is all the TOPPINGS though yum!! Yeah I regret using the oven so much this week haha the weather is crazy hot!